I took a quick trip to Houston this past weekend for what history will record (as long as I’m writing it) as the first-ever TUS QuiltCon. Mel and I organized it and, to keep things manageable, were the only attendees. 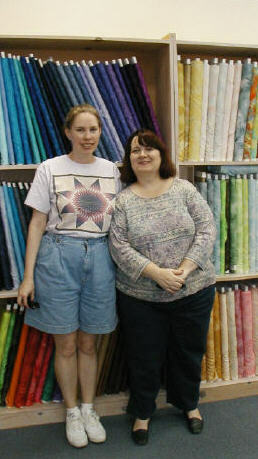 Maybe next year we’ll invite other people, though we’ll probably have to limit them to just the margarita-related portions of the event, since very few people on the forum have the interest and stamina necessary to quilt shop hop at the serious level required to keep up with Mel and me. Before the shopping could commence, I had to get myself to Houston, which I did on a Friday night flight that was not only on time but also had some empty seats on it. Oh, the luxury of having both armrests to myself and being able to put my carryon in the overhead bin without feeling the slightest bit of guilt for taking up space there in order to have a little toe room down below. I bet that’s what the first class passengers feel like all the time. Well, good, now you don’t have to make two stops to get floss for your latest cross stitch project and ammo for the tournament. The store wasn’t open, so I only imagine what such a fun for the whole family kind of place might have in addition to embroidery and paintball. Giggling, I drove on to McDonald’s, where a glance at the menu revealed that there was a new kid on the breakfast block: the McGriddle. I’m sure the woman working behind the counter thought I was an idiot for asking what it was; “What kind of moron needs fast food explained to them?”, I could almost hear her thinking. I took a chance on this new creation and thus had my first experience with the best McDonald’s breakfast food ever: the Sausage McGriddle. You pick it up and eat it just like a typical breakfast sandwich, and it has all the artery-clogging fat you crave combined with the sugar you’d normally have get by eating a Danish on the side. You see, instead of a biscuit or English muffin, the McGriddle is made with two fat pancakes laced with maple syrup balls. It’s perfection itself, and also much easier to eat than my former pick for best McDonald’s breakfast food ever, the Spanish Omelet Bagel. Satiated, I returned to the hotel to wait for Mel and ponder why the decorator had chosen to put a gigantic silk flower arrangement on the coffee table in the lobby, effectively eclipsing anyone who, like me, sat down on the couch. Good thing I’m as tall as I am, or I would have had no view of the front door at all. To pass the time, I worried as I waited, even though I’ve had nothing but good experiences meeting people from online out in the real world. Would she like me? Would I like her? How would we each match up to the images we project in cyberspace? Would she run away in horror as soon as she saw me? (Well, okay, I didn’t actually worry about her running away, because if she did, that would make a great story to tell when I got back, and that’s what going on trips is all about). Mel arrived and we managed to spot each other through the faux blooms. Wasting no time, we headed off to start our quilt shop tour. I think it’s a testament to our dedication (or maybe our lack of careful planning) that we two non-morning people arrived at the first shop before it was open. We thought we’d hit the bookstore on the other side of the strip mall while we waited, but it, too, was closed until 10, so we were practically forced to go to the Wal Mart across the street, which does have quilting magazines, so it was still in the spirit of the Con. Fortified with the latest issues of several publications, we headed back across the street to start the serious business of fabric browsing. I love coincidences, so I was delighted to see that this shop stocked the same textured cottons that I’d bought when I went to TorontoCon and hadn’t seen anywhere before or since. Of course I had to get some, but I couldn’t remember which colors I already had, so I settled on just the white, which I was pretty sure I didn’t have and even if I did, it’s always good to have some substantial white fabric on hand. In addition to that, I got a few other pieces, but I knew I had to pace myself because whatever I bought had to fit into my carryon. I would not, could not overbuy. Our next stop was Spring, specifically the cute little quasi-historic shopping district therein (warning: Tripod site). Amazingly, there were two places to buy fabric there, one a true quilt shop, where I found a companion print to a panel I’d bought at our first stop (I told you I like coincidences), and the other a place with several rooms of fabric mixed with clothing and home accessories and I’m not sure what else because I was concentrating on the fabric. There I got a print that I think will be perfect for making JournalCon swag, should I decide to get all crafty again like I did last year. We refueled with lunch at an actual historic building in its historic location– good bread, lousy bathroom– in between the browsing and buying. Then it was off to The Woodlands– well, close to The Woodlands, anyway. I’d spent a little time in this part of Texas back when I worked my last big corporate job and got probably a little too excited when I spotted something I recognized, but Mel was polite about my outbursts over the Drury Inn and what I though was the restaurant my boss once took us all out to eat at. The quilt shop here was excellent, with lots of bolts of things I hadn’t seen before (I took many notes about manufacturers and line names so I could try to find them later when I wouldn’t have to worry about luggage space). I also scored a yard of a print I’d been coveting since I saw it in a jacket one of my friends at work made. We were verging on being shopped out at this point, but pushed ourselves to make one last stop. If I hadn’t had Mel as my guide, I’d have been convinced I was headed in the wrong direction as we passed by the chemical plants and industrial parks on our way to the best shop of the day, Painted Pony ‘n Quilts. The selection was outstanding and the layout of the shop was excellent. They had thousands of bolts of fabric arranged in separate, spacious rooms so it wasn’t overwhelming, even at the end of a full day of shop hopping. My run of happy coincidences continued when I found another colorway of the companion print I’d bought at the second shop that went with the panel I’d gotten at the first one, and this piece was even on the sale table. Since it was the end of the day, the shop wasn’t very busy, so the ladies working there were able to indulge our request to have our picture taken in front of one of the many walls of fabric. Enough shopping, it was time to eat. We settled on a Mexican restaurant not too far from the hotel, where we had margaritas and talked and had a yummy cheese and chorizo appetizer and talked and had tasty entrees. I was happy that we hadn’t run out of things to say to each other, since that was one thing I had worried about– being with someone in person is a different than interacting with them online, but I felt completely comfortable making the transition with Mel. The last official event of the Con was an impromptu quilt show back at the hotel. Mel had brought a few of her works, and they were wonderful! I’d seen pictures of some of them, but that didn’t do them justice. Even the backs of her quilts were fun, with many patches of different fabrics to look at, more than I’ve ever attempted on the back of mine. I was riding a post-Con high after Mel headed home, so I decided to go to the mall I’d glimpsed nearby and see if I could find a little present for Mr. Karen, since I didn’t think I’d be able to get anything at the airport in the morning due to the ridiculously early departure time of my flight. From the outside, it looked like any other mall, and inside I soon found a store with Texas stuff in it where I got a magnet and some jam. Not long after that, I walked by a store that had men’s clothing the likes of which no man I know would ever wear, such as purple crocodile loafers and an orange suit with a knee-length jacket. I know I’m buying into stereotypes here, but I immediately dubbed it the pimp store. Having seen it, I was not too surprised when I came upon the ho store down the way. Mannequins with big bootys modeled shorts with half-inch inseams and tank tops constructed from what looked like string and staples. I was obviously way out of the target demographic for this place. I was walking to the exit of what I’d now come to think of as the pimp and ho mall when I felt a pain in my foot. I looked down and saw a toothpick sticking out of my ankle– the mall did not appreciate me thinking about it that way, evidently, and decided to attack. Very strange. I wrapped up my day by trying out the Fairy Jasmine bath bomb from Lush I’d been afraid to use at home for fear of making a glittery mess. I figured I’d just adjust my tip to the maid based on how many sparkles would have to be cleaned up after I checked out. As it turned out, it wasn’t too bad. It was very glittery, yes, but I was able to rinse most of it off and just keep the nice fragrance. I only wish I could have enjoyed it longer, but I needed to get to bed so I could arise in time to get to the airport by 6 a.m. for a 7:30 flight. I made it and was surprised to see that the airport gift shop was open at that hour. Not only that, there was a McDonald’s open, too, so I was able to partake once more of the McGriddle magic before boarding my completely full flight for the trip home. It was a good end to a good trip (well, except for the sleeping guy seated next to me who flailed in his dreams, but I’m blocking him out).